Following on from last year’s exhibition ‘My Jesus Lets Me Rub His Belly’ that examined issues of place and faith when the artist was growing up, Martin Smith now presents a slice of poignant son father love at Sophie Gannon Gallery, Richmond. 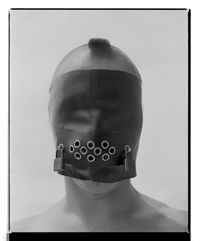 The combination of images and text create narratives on growing up, life, male bonding and mortality. 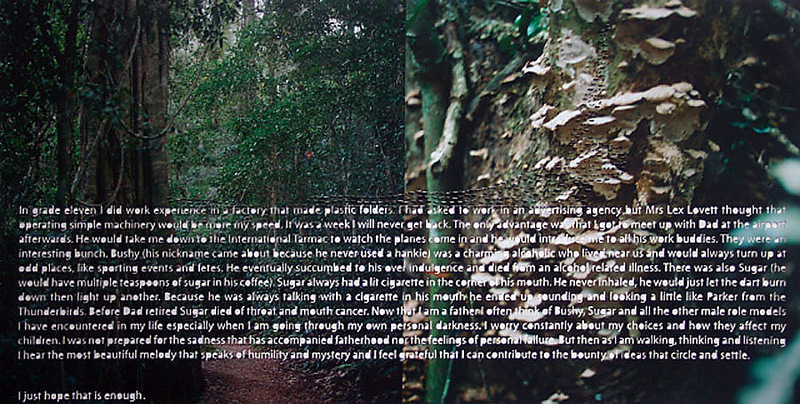 In ‘Fix It Up’ (2010, see photograph below) the use of a circle of text on black (the circle of life) in this image paired with a dark photograph of moss covered twigs and branches is exemplary, the metaphor of the arborist chopping down a gum tree in the backyard as his father is waiting to be taken to hospital by ambulance with prostrate cancer, the last time he will be present in his house, incredibly moving. The use of blurred images, such as the central panel in the triptyph ‘Sydney’ (2010, see photograph below) adds emotional weight to the narratives, as though the stories told can only be fragmentary memories, as all memories are, of the events that have passed. 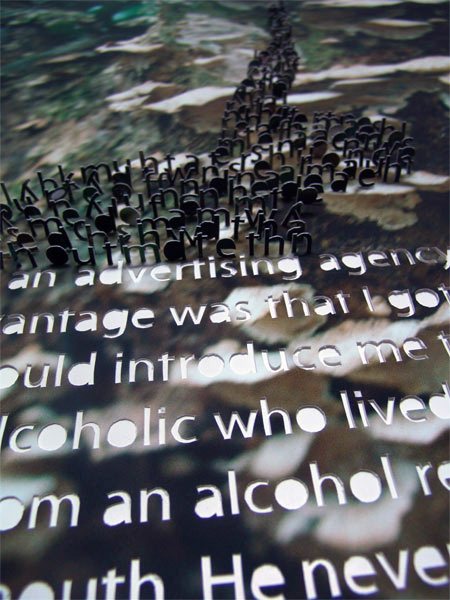 The feeling of an excavation of the meaning of life and death is further enhanced by the incision of the letters into the photographs surface and the extrusion of the letters to form three-dimensional sculptural forms, as in the work ‘Enough’ (2010, see photograph and detail below). 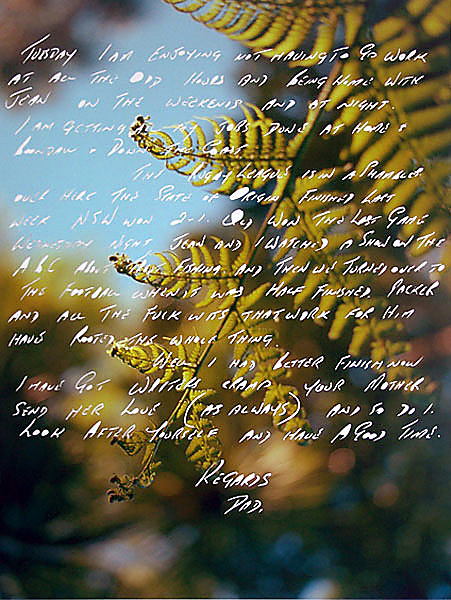 The letters shape references the fungi on the tree behind, new life growing out of old, as though the words were being extruded out of the forest, archives of communal memory. This illumination of the mind, body, memory and spirit is what Smith’s work is all about. I adore it. Please click on the photographs for a larger version of the image as it is important to read the text with the larger horizontal works (in some you can’t read the text, it is too small – apologies). Many thankx to Edwin and Sophie at Sophie Gannon Gallery for allowing me to publish the photographs in the posting. All photographs © and courtesy of the artist and Sophie Gannon Gallery.